Crawling and cogging both are particularly related to squirrel cage induction motors. Sometimes, squirrel cage induction motors exhibits a tendency to run at very slow speeds (as low as one-seventh of their synchronous speed). 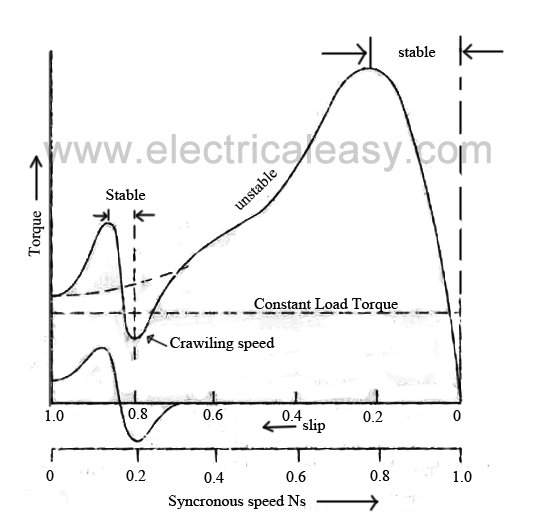 This phenomenon is called as crawling of an induction motor. This action is due to the fact that, flux wave produced by a stator winding is not purely sine wave. Instead, it is a complex wave consisting a fundamental wave and odd harmonics like 3rd, 5th, 7th etc. The fundamental wave revolves synchronously at synchronous speed Ns whereas 3rd, 5th, 7th harmonics may rotate in forward or backward direction at Ns/3, Ns/5, Ns/7 speeds respectively. Hence, harmonic torques are also developed in addition with fundamental torque. 3rd harmonics are absent in a balanced 3-phase system. Hence 3rdd harmonics do not produce rotating field and torque. The total motor torque now consist three components as: (i) the fundamental torque with synchronous speed Ns, (ii) 5th harmonic torque with synchronous speed Ns/5, (iv) 7th harmonic torque with synchronous speed Ns/7 (provided that higher harmonics are neglected). Now, 5th harmonic currents will have phase difference of 5 X 120 = 600° =2 X 360 - 120 = -120°. Hence the revolving speed set up will be in reverse direction with speed Ns/5. The small amount of 5th harmonic torque produces breaking action and can be neglected. The 7th harmonic currents will have phase difference of 7 X 120 = 840° = 2 X 360 +120 = + 120°. Hence they will set up rotating field in forward direction with synchronous speed equal to Ns/7. If we neglect all the higher harmonics, the resultant torque will be equal to sum of fundamental torque and 7th harmonic torque. 7th harmonic torque reaches its maximum positive value just before1/7 th of Ns. If the mechanical load on the shaft involves constant load torque, the torque developed by the motor may fall below this load torque. In this case, motor will not accelerate upto its normal speed, but it will run at a speed which is nearly 1/7th of of its normal speed. This phenomenon is called as crawling in induction motors. Sometimes, the rotor of a squirrel cage induction motor refuses to start at all, particularly if the supply voltage is low. This happens especially when number of rotor teeth is equal to number of stator teeth, because of magnetic locking between the stator teeth and the rotor teeth. When the rotor teeth and stator teeth face each other, the reluctance of the magnetic path is minimum, that is why the rotor tends to remain fixed. This phenomenon is called cogging or magnetic locking of induction motor.